Stowe Boyd is predicting Yahoo / Facebook merger. Android and ChromeOS will converge. Like all ostensibly sensible ideas, this is probably a bad one. The whole point of Android and ChromeOS, right now, is that they're "playful experiments", tweaking Microsoft's tail, exploring new markets. There's no point Google having a big, boring engineering consolidation project to bring them together. That's just going to alienate internal developers ("but this is my baby!") and confuse third-party developers ("shall we wait for the convergence?"). Better to have a reasonably decent Android emulator running on the ChromeOS machine so that Chromebooks can run Android apps. Update : read the comments on this blog-post. ("this blogpost" meaning this one, on Platform Wars). Lots of good discussion there. It could be that everyone will figure out how to play nicely with each other, and we'll see a continuation of the interoperable web model we've enjoyed for the past two decades. But I'm betting that things are going to get ugly. We're heading into a war for control of the web. And in the end, it's more than that, it's a war against the web as an interoperable platform. Instead, we're facing the prospect of Facebook as the platform, Apple as the platform, Google as the platform, Amazon as the platform, where big companies slug it out until one is king of the hill. Update : don't miss this analysis of Google's "less than free" model and mapping data too. Good overview of smart-phone market in light of latest Droid phone. Pundits seem to agree : motorola + android == win. Bad news for RIM, Palm and Nokia. Following such a strategy, then it could be Game, Set and Match to MSFT for the next twenty years and the open source movement will find itself crushed by this juggernaut. Steve Jobs is very clever. If Apple had implemented Flash on the iPhone, it would have quickly become the cross-platform standard, and Adobe would have owned the whole mobile-app. market. Possibly we'd have been talking about an Adobe App. Store. Microsoft's nihilist "scorched-minds" advertising campaign continues. Remember, the whole reason for these adverts is to make you believe that the universe is an absurd place where Manichean structures (such as Apple==cool/PC==uncool) don't obtain. Your Company? There's an app. for that. I like the comments on Cringely's outline of Google's work environment. Which I guess puts the end of my whole "skypal" thing. I'm sort of surprised that nothing came of it. OTOH, I'm not that surprised given that Ebay doesn't seem to be much of a "visionary" company at all. Can't remember when they actually did anything interesting given their size / potential influence. Dave Winer is enthused by the new iPhone Facebook. Listen to the linked mp3 piece about Craiglist's "demonetization" of the newspaper business. People are still mystified this ... witness questions like "the money disappeared ... where did that value go?". Come on! "Money" doe NOT equal "Value"! That's the core of TCP/IP vs. the Dollar, money and the net are rival stores of / circulation media for value. Bonus : A comment I wrote about "Free" over on Blahsploitation. Has Microsoft got its edge back? It's on the offensive, but I'm not convinced by the ZDNet piece. In every one of the battles mentioned, M$ faces an opponent who got successful doing something interestingly different ... whereas M$ is allegedly striking back more or less by copying the opponent. Interesting state of The Mechanical Turk roundup. For most users of mechanical turk (us included), it has become an API call that fits smoothly within their workflow. (Or as someone at the meetup wryly suggested, turk is a Remote Person Call.) The last pair of speakers, Lilly Irani and Six Silberman, reminded us that behind mechanical turk lies thousands of workers† ("the crowd in the cloud") working without (health care) benefits, oftentimes at extremely low hourly wages. Irani and Silberman suggested that rather than abstracting mechanical turk services as mere API calls, users should start thinking of the plight of the turks ("Mechanical Turk Bill of Rights") behind the service. As a first step they have a released a Firefox plugin that aims to narrow the information assymetry between the turks (those performing task) and requesters (those posting tasks). While requesters can see ratings for turks, requesters aren't rated: Turkopticon lets turks rate requesters. They need more turks to download and start using Turkopticon, so if you know any mechanical turks please enourage them do so. Meanwhile, even Intel seem to be trying to get into the netbook OS game with Moblin. Google is providing the idea leadership that the Java community needs. I have harped repeatedly (HERE and HERE) about the fact that the next version of the iPhone OS (and the underlying SDK) will allow third-party hardware accessory makers to build external hardware accessory offerings that take advantage of the software, service and hardware capabilities of the iPhone and iPod touch platforms. I'm also willing to bet on the ultra-conservatism of the majority of users, and predict that they WON'T GET IT. This will have made hardly a dent on either email or M$ Office use by this time next year. Most people will be confused (rather than delighted) by the blurring of email, document editing and real time conversation. Early adopters won't be able to use it to send emails or share documents with late-adopters, so hardly anyone will be able to use it in enterprises etc. The people who'll be most affected by this are 37 Signals, Huddle, SocialText etc. who are trying to sell web-based project management or enterprise blogs and wikis to early adopters. It's gonna be a tsunami in that market. Nevertheless, can't wait to play with it. Dave Winer continues to be clever and inventive. Phase 4. All those above+All People (in the social graph). Phase 5. All those above+People and businesses in the social graph. Phase 6. All those above+People, businesses, and well-known objects in the social graph. Phase 7. All people, businesses, objects in the social graph. Facebook is now well over twice the size of MySpace, according to recent worldwide Comscore data. And what's worse, MySpace is losing audience while Facebook absolutely hockey sticks: MySpace lost 2% of users in just one month, while Facebook grew by nearly 40 million members in February alone. MySpace currently has 124 million monthly unique visitors, compared to Facebook's 276 million. Here's something interesting : look at how Chumby is not all about their hardware, but is making reselling their personalized feed handling to other companies and devices (including TV). Dare on Feeds as the new Email. What is it like to be a bot? Just discovered a Bespin which I believe to be *really* significant for the software industry. Essentially, all the important parts of the software industry have now migrated into the cloud. Including the software development environment itself. Things are moving *very* fast, aren't they? Will live (Twitter) search kill Google? Especially when you compare what Clay Shirky says about filters in the last part of this interview..
Biggest threat to Microsoft revenue. Dare Obasanjo on Google's cancellation of side-projects. Good points. Though I thought that Jaiku and Dodgeball were buy-ins rather than 20% time projects. The most likely scenario is that Amazon didn’t want to talk about its Kindle-iPhone connection, which may have people wondering why they need a Kindle in the first place. However, whispersync lays the groundwork for a few interesting possibilities. Have we brought up an entire generation to believe that cash isn’t important? To which the right answer is "Yes". Because it *isn't* so important. And NOT because of the same ultra-cash-focussed casino games of the financial sector although Wainewright tries to tar "free" with the same brush. Mary-Jo Foley highlights the confusion of Microsoft's Windows upgrade roadmap. I've no idea what corporate Windows users are likely to do, faced with this mess. But M$ could be making it a lot better. Here's one suggestion : Give Windows 7 away, free-as-in-beer, to all existing Windows Vista licensees. XP users still have to pay to upgrade, but M$ should get everyone off Vista and on to Windows 7 as quickly as possible. This is, of course, assuming that Windows 7 is as good as everyone says it is. But what about earlier incompatibility issues? Once again I ask, isn't Windows 7 based on the same core as Vista? Are they making it better than Vista by undoing some of the things that were new in Vista? Can 7 be both more compatible with XP and more compatible with all the new .NET stuff that came out on Vista? Unsurprisingly netbooks are hurting Microsoft. Allegedly Windows 7 will run pretty well on netbooks. I'm totally ignorant of the details here, but this surprises me. I always assumed that at least some of the reason that Vista appeared so clunky was that more of Windows had moved to Managed Code in a sandboxed virtual machine. Does the performance improvement mean that Windows 7 moves some things out of that? Or have they found a way to make it more efficient? So ... what's 2009 bringing us so far? Wardley's dream of an open sourced cloud standard comes closer. I don’t intend to denigrate the undoubted capabilities of other SaaS billing vendors ... But all of them take a traditional, project-based approach to implementation that means the usual to-ing and fro-ing before you can get anything up and running. Whereas Zuora lets developers work directly with its APIs, charging nothing until the service is ready to go into production. That’s a major advance and one that means developers at last have a low-threshold option for including proper subscription management and collection in their pay-as-you-go applications. 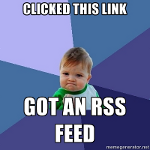 Incredibly, enterprise RSS is dead! My first, flippant thought : Enterprises just take forever to adopt stuff ... give it another 10 years or so. But that's not really true. I'd suspect that the real issue is this. Enterprises are a life-form with a certain kind of structure, held together by specific forces. Like a single-cell organism, puncture the membrane and it dies as its resources just drain away. And RSS is rather like a nano-needle. We *imagined* that social-software would burst the enterprise. Instead, the enterprise resolutely rejects it. No senior manager (who has a certain amount of "between-ness centrality") wants to legitimize the automated software streams that would route around him (or her), bypass the company's official PR outputs, bypass the company's official sales department's inputs. RSS is an example, but the same is true of blogs, wikis and other social software that threatens the corporate structure. Hell! If you're in a Windows shop you don't even get a web-server on the corporate intranet as standard. If there had been demand from corporate clients, Outlook could have been a web and RSS and a wiki server (out-of-the-box) to allow colleagues to co-operate more effectively. It isn't. Because M$ didn't want to piss off IT departments by taking away their control of the corporate servers. You may think that new, RSS powered upstarts will come along and defeat the dinosaurs who reject social software. But maybe the fluidity, interpenatrability of such social companies will prevent them ever growing large. Maybe there'll remain a sea of small companies whose boundaries are too malleable to congeal into the next generation of dinosaurs. The sea will get bigger, and the dinosaurs will dissolve. But RSS will never be "the next big thing"
Could 2009 be the year that someone tries to hook a micropayment system to a YASN? I missed until now, but enjoyed, Stowe Boyd's 2009 predictions. It's not true, for a dozen reasons (Twitter's locked-in community, less openness etc.) But worth thinking about. What is it like to be a bot? Fascinating.